In this video, he is performing "Dancing With the Bride" on his legendary invention. His instruments are his own inventions. 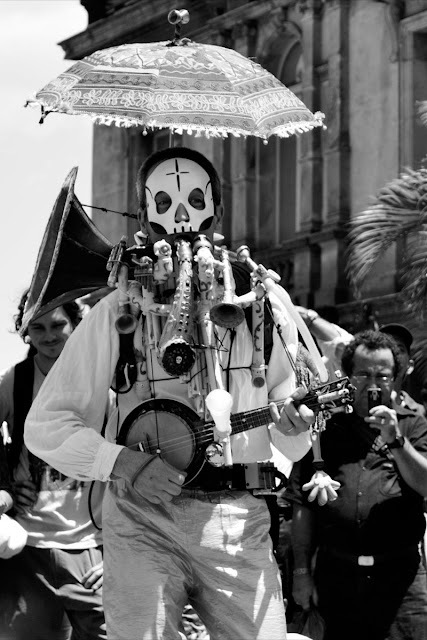 Nowhere else can you find instruments like "The 1 Man Bandit", (the classic "on the back" type one man band taken to the extreme, and miniaturized featuring amazing digital effects to create vocal harmonies from just one voice, a vocal synthesizer and a chromatic bass pan flute for amazing organ effects! 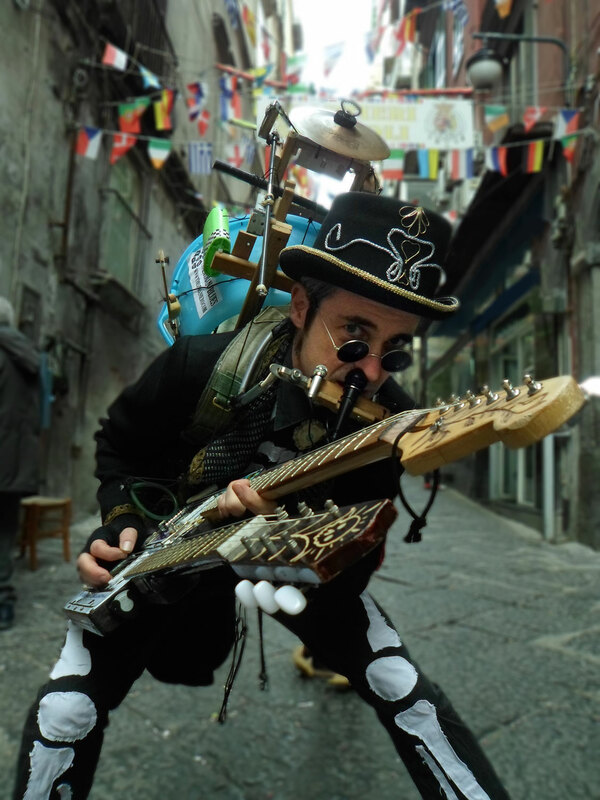 ), "The Electric One Man Band Experience", (A sit down one man band with electric guitar for a loud blues/rock sound great for stage shows) and "The Stranierofono", (the combination bass clarinet/accordion that finest luthiers in Europe have called impossible and is even documented in the International Museum of the Accordion in Castelfidardo, Italy!) All of the Straniero's instruments are beautifully decorated with internal colored flashing lights as well. They are as much a pleasure to look at as to hear. Mark's experience has taken him from television and radio performances in North and South America, Europe and Asia as well as TV commercials in Japan and Dubai to the professional Shakespearian theater circuit. He is equally at home on the big stage as the street. He can play a small private party or a concert for thousands. The Straniero's street show requires only space to play (fairly level ground). All instruments, amplifiers and lights are battery powered and there is no need of electrical current for less than 2 hrs. For more than 2 hrs. an electrical outlet is required close to the performance space for re-charging. For walk-about shows, the organizer must clearly ask for a walking show. There are additional costs for walk-about shows and special equipment must be brought by the artist from home. For stage shows, The Straniero requires only one instrument mic with a boom stand. Check out his website www.thestraniero.com!